I went outside before coffee, before breakfast, before sunrise — Like that will ever happen! — to sweep the back patio and rake the maple keys out of the yard (again) and to water the lilac and weigela. They were shallow-breathing. I couldn’t take it any longer and folded like a wonky soufflé. We almost always stay in Edmundston, NB when we’re wandering in the wilderness traveling to the east coast.. A lot of roadmancers do. It’s just done. 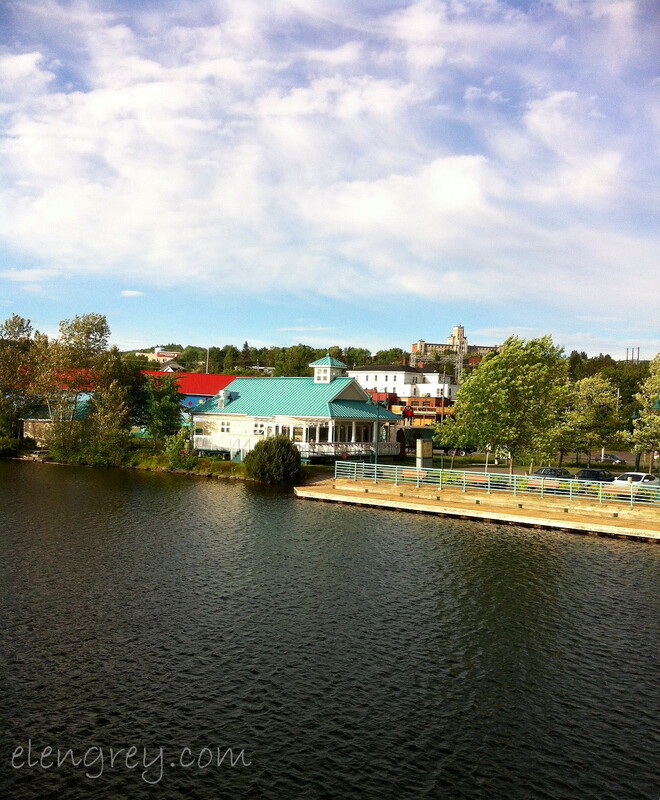 So, I’ve written about Edmundston before. We arrived early evening, checked-in, discovered our hotel put in a resto-bar since our last visit — Put your hands up in the air! — drove through town, and took a walk by the river. 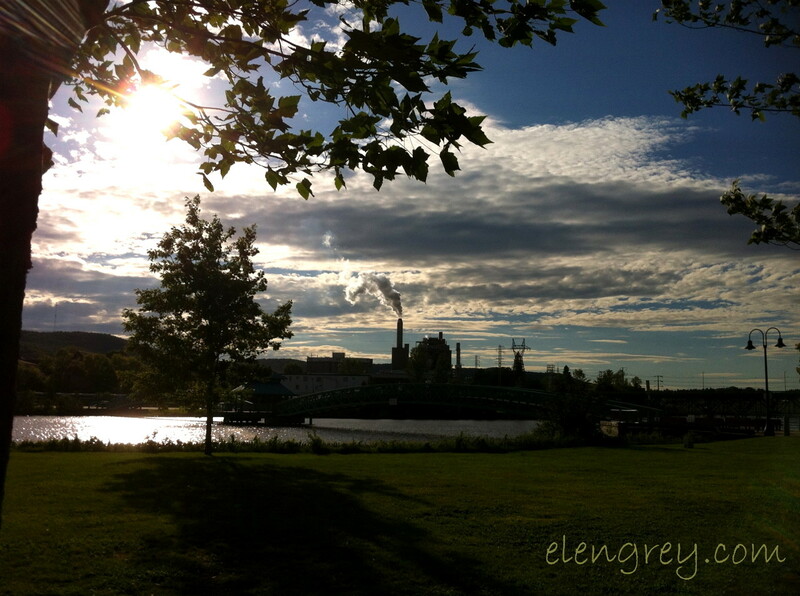 Edmundston (Pop. 16,000+) has a beauty and a charm. I love that the mayor holds the title President of the Republic of Madawaska. There’s a well-used community park running along the river. We happened upon an outdoor dancercise class. I wanted to jump into the back line, but my flip-flops just wouldn’t cut it. Those women were movin’. I spoke with everyone I met on the path. Met a woman being walked by her dog. A true Edmundstonian. Edmundstoner? She married a Mainer, just across the river in a town (with a post office and a McDonald’s) about a tenth the size of Edmundston, so she crosses the border regularly for the Edmundston scene. I think this regular border-crossing was part of the prenup. What kind of writer would I be if I didn’t get her story? Scarecrow, Cowardly Lion, Tin Man! That’s just the way my brain works. I talked with everyone I met and looked at G-Man and said — See. I know how to do the village thang. Yup. 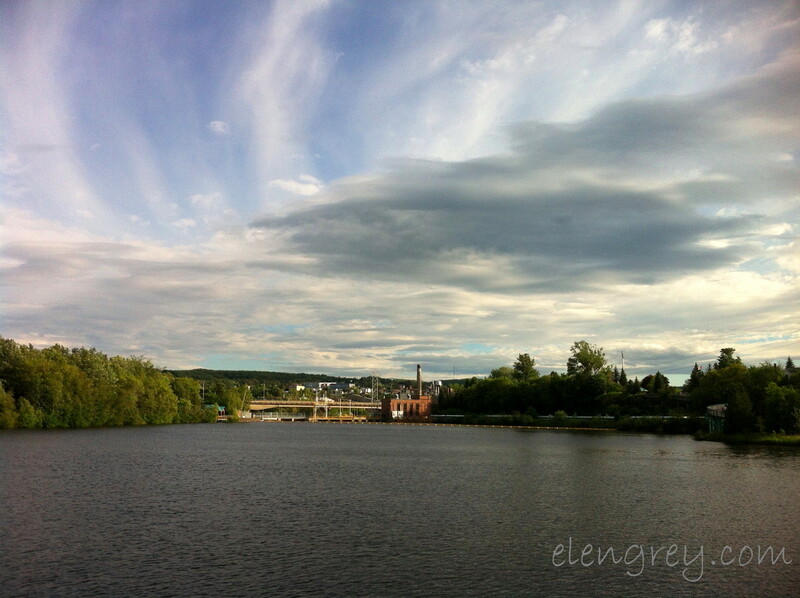 I have a fondness for Edmundston. Just do! We head out the next morning bright and not too early. That’s how we roll. Time to turn the Atlantic Provinces Map (New Brunswick, Newfoundland and Labrador, Nova Scotia, Prince Edward Island) over to the New Brunswick side. It’s not a long drive for the day. 371 km (231 mi). 4 hr 3 min with no construction, no traffic, no stops for camera time (Like that’s going to happen.) This will be a repeated refrain. We run down the Trans-Canada Highway, hugging the New Brunswick-Maine border until Woodstock (not that Woodstock), then we start heading east and just under Fredericton — Sorry, Fredericton! You’re not on our itinerary this trip. We still love you. — and head south on Highway 7 to Saint John. Trees and rock. Rock and trees. If there is a rest stop in New Brunswick, we didn’t find it. Irving Oil is king, and that’s where you go. 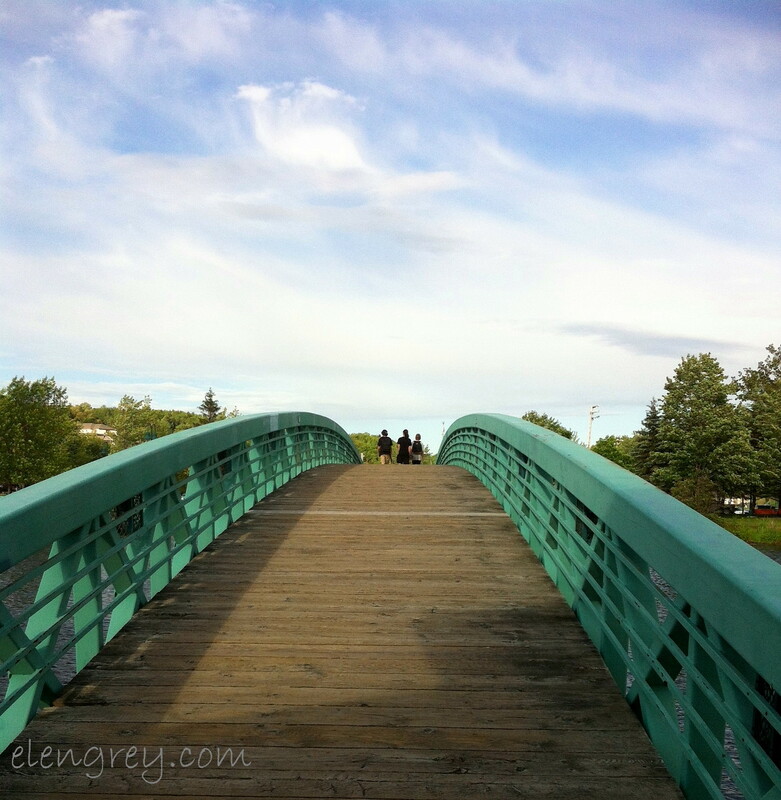 We discovered that little tidbit at Oromocto, New Brunswick (Pop. 8,900). We exited the highway when we spotted the Irving sign. We needed gas and a pee break. Can I say pee break? Because, you know, powder room doesn’t sound very roadtrippy. Just sayin’. And that’s when we stumbled on the Blue Canoe Restaurant. It’s part of what they call an Irving Big Stop — gasoline, mini-mart, clothing, liquor, trucker’s private lounge, trucker’s private dining room. The wimmin all ended up in the trucker’s private lounge to use the facilities because the regular wimmin’s washroom was out of order. It was a long line. Verra long. Cross your legs long. There isn’t any question that you’re at the Blue Canoe, because there is a freakishly blue canoe on the lawn outside the building. Total love. She Who Must Be A Drama Queen sobs with gusto. Did not get a click of the Blue Canoe. How did that happen? There are some images here. It’s the wild blue yonder, I tell you. The place was bustling and hustling. It is an obviously popular spot with locals and travelers. It was jam-packed. And I’m up for eating anywhere the locals eat. The main dining room is big and casual. Red checkered tablecloths on square tables, wait staff in blue, an in-support-of-a-charity dining section that could be reserved. The service was fast and friendly. The food fresh. TripAdvisor gives it a Certificate of Excellence and lists it as #2 of 32 restaurants in Oromocto. Since we were in New Brunswick, we decided to order the special of the day — deep-fried shrimp and scallops with coleslaw and fries. Holy Shrimp and Scallop, Batman! No wonder everyone was smiling. Our server asked if we would like the fresh bun that comes with it. I looked at the table to my left. Those buns were the size of bread and butter plates. I blinked and said, I don’t think I can handle that. She said, That’s why we like to ask. I ate one breaded shrimp and proceeded to de-bread the rest of my shrimp and scallops. Those shrimp were huge, and I would never have finished them otherwise. No shrimp left behind! I’m a bit of a shrimp and scallop ‘ho, so I hope I never develop an allergy. We couldn’t justify sitting on dessert the rest of the way to Saint John so… skipped that. Let’s just roadmance all the small adventures with shrimp and scallops on top. Elen ~ Olympic Gold Medalist in Exclamation Points!! P.S. My biggest fear writing this post was getting the “d” in Edmundston every single time. Crosses fingers. Thank you so much, Joan. 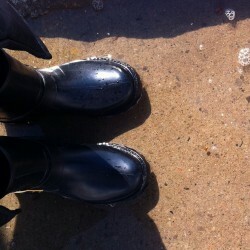 I’m home and blogging post trip. 😉 It was a tough call on the bun. Thank you so much for the nomination. Is there a link where I can find out what I should be doing with 5/photos5/stories? I hear ya. I have a fondness for small places. Take a stroll next time. They’ve even added a new coffee bar where you can get an espresso, if that’s your thing. 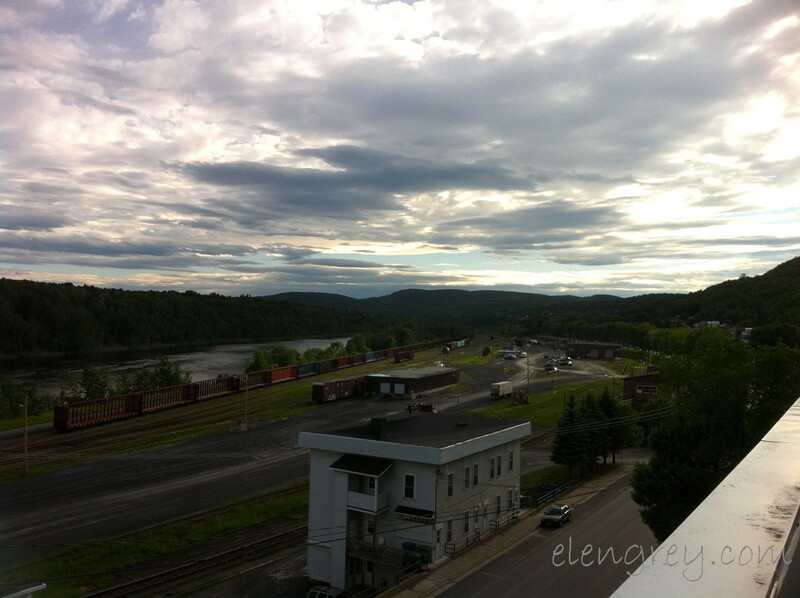 Edmundston sits in a beautiful spot for sure. You learn something new almost every day 🙂 And all I have ever seen is the Subway and the McDonald’s on the highway!! So Elen, you did Edmundston such justice they should pay you. I have to say that being from N.B. that same town thang is who I am but since I’ve live in Ontario for so long I feel like I’ve changed so much (not for the better). I’m looking forward to leaving for the Maritimes in 2 weeks to get my mojo back and see my peeps. The Blue Canoe is a fave hangout of mine. Back in my single days that’s where I’d take a date. If he couldn’t mix with the locals and be cool. He was out! Jeez those were the days. Useless men, but good food. Just the way I like it. Not only did you get the D in Edmundston but you got d-bomb with this post. Way to make a girl so homesick she needs to go for a Pee break. Kellie, Kellie, Kellie! I’m so laughing. Every time I go through Edmundston, I see something different. The peeps are friendly. You’re not going to find every ethnic food Toronto has to offer or the second largest entertainment district in North America, but it has a quality. Loved the Blue Canoe. Now that I know you used it as a dating litmus test, I love it even more. Thanks for your nice words about this post. Happy you enjoyed it. Where are you visiting? What shouldn’t I miss in the Maritimes next time? Thanks for the photos from my home town (Edmundston) from angles I’ve never seen. My first full-time not-between-university-terms job was in that Shoppers Drug Mart on the hill. Of course it’s changed a bit in 42 years. That shot of the rail yards and what was once the train station still has me confused; have to check that one out at my 50th high school reunion next summer! Hee. It’s a small world after all. It’s a…. 😉 Well, you’re welcome! For the life of me, I can’t remember where I was standing when I took that shot. I know I took several clicks from there. Maybe the G-Man will remember. You’ll have to have a good walkabout when you’re home! It’s OK, I know where the picture was taken from, it’s just not somewhere I’ve walked in the last 50 years!